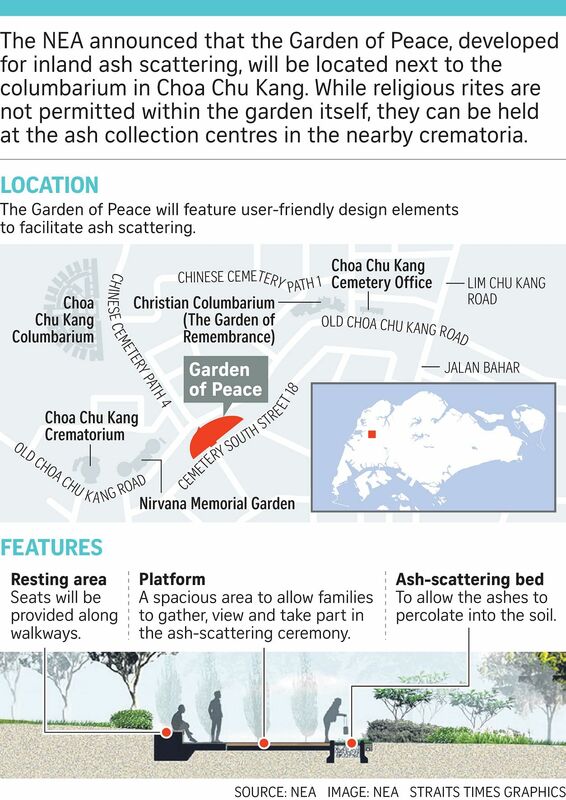 Environmental landscaping and natural greenery will be incorporated into a new ash-scattering garden at Choa Chu Kang Cemetery, aptly named Garden of Peace, to create an atmosphere of privacy and serenity. There will be separate lanes lined with a bed of pebbles to allow the scattered ash to percolate naturally into the soil underneath. The garden, which will be unveiled next year, will include seating areas and will be wheelchair accessible, allowing families to easily gather, view and participate in the ash-scattering process. However, the National Environment Agency (NEA) has stated that religious ceremonies or rites, including the burning of joss sticks, leaving food offerings, inviting clergy and playing instruments or music will not be permitted within the garden. This is to maintain its cleanliness and serenity. The garden, designed as a secular facility, will be open to people of all faiths. The decision to introduce the ash-scattering service followed a series of consultations held from August to December of 2017, involving religious groups, after-death care service providers and the public, said NEA. It has been studying the option since 2014, including how it is implemented in other countries, and has put in a tender to develop the site. The service will also be implemented in the Mandai Crematorium Complex in 2021. The only option available now for ash scattering is to do so at sea. Families can also opt to keep them in a niche. The greenery and tranquillity of the garden will instil a sense of peace in grieving families, and hopefully help them come to terms with the death of their loved ones. MADAM KHOO SIEW ENG, an advocate of the Green Burial Movement, which champions eco-friendly burials. Madam Khoo Siew Eng, 59, an advocate of the Green Burial Movement - a group of volunteer advocates seeking to promote eco-friendly burials - has welcomed the addition. "A lot of people think of cemeteries as creepy or eerie. This garden is a totally different concept. When you send off loved ones, I believe a peaceful, sensory environment is extremely important," she said . "The greenery and tranquillity of the garden will instil a sense of peace in grieving families, and hopefully help them come to terms with the death of their loved ones," she added. Madam Khoo said that in land-scarce Singapore, the scattering of ashes is a better option than the relatively more costly one of land burials offered at Choa Chu Kang Cemetery. At least one company, The Life Celebrant, has already started to offer inland ash-scattering services to interested families who are willing to wait for a year until the garden is ready.